Tolibkhon Shakhidi (13 March 1946) was born in the city of Dushanbe, Tajikistan. His father Ziedullo Shakhidi, was the founder of twentieth century Tajik music. Tolibkhon began his musical career at the age of fourteen and graduated from the Musical College in Dushanbe in 1965 from the Composition Class of Uri Ter- Osipov. In the same year, he entered the Moscow Tchaikovsky State Conservatory. During his student years in Moscow, he strove to be at the centre of musical activities. Conductors such as Mikhail Terion and Maxim Shostakovich performed his orchestral and instrumental compositions. In 1972 Tolibkhon Shakhidi graduated from the Moscow Conservatory from the class of Aram Khachaturian. 'Tolib, your time is precious,' wrote the famous master on Shakhidi's graduation photograph – and since then, this has become the composer's fundamental belief both in life and in his creative work. From 1972 to this day, Tolibkhon Shakhidi has participated in a number of music festivals and has striven to produce innovative and powerful compositions. His music attempts to create a synthesis between East and West. His brilliant understanding of orchestration and familiarity with different musical styles have firmly established him in the contemporary music scene. Working in a number of different genres, including theatre and cinema, Shakhidi's compositions often serve as the vehicle for the musical representation of intensely powerful plays. Drawing inspiration from playwrights such as Sophocles and Shakespeare, Shakhidi's compositions capture the listener's imagination much as a dramatic representation would. 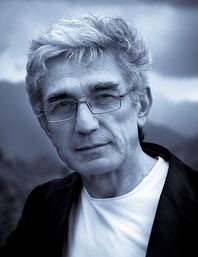 Tolib Shakhidi won several awards including the International Competition of Contemporary Music in the United States and the National Rudaki Prize in Tajikistan. Tolib Shakhidi have 6 Author CD's and a DVD published in London and Moscow. Please check the CD's section. «Istanbul-capriccio»—for saxophone and chamber orchestra. VIEW & LISTEN THE MARCH!